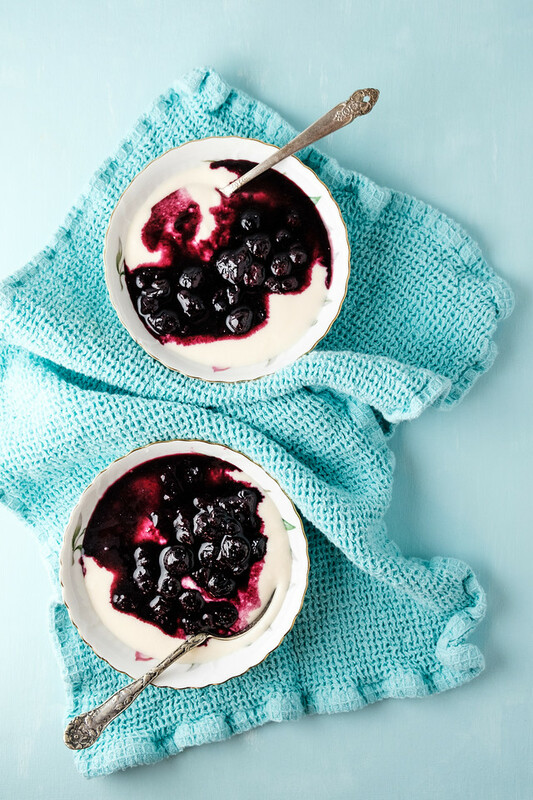 This Blueberry Compote with Honeyed Yogurt makes a healthy dessert, snack or even breakfast! Anyone else feel that a meal is just not complete without a little dessert at the end? Both my husband and I are big dessert fans. It doesn’t have to be over the top, just a little something. I like the idea of dessert, what I don’t like is the empty calories that it usually brings to the table. So, I have set about finding healthy desserts. I’ve found the easiest way to create a healthy dessert is with some fruit and some yogurt. I found a recipe for a cherry compote with yogurt and decided to modify it to make this Blueberry Compote with Honeyed Yogurt. Don’t get me wrong, I never say no to cherries, but I had blueberries and I didn’t have cherries. The beauty of this recipe is that it can be a healthy dessert, healthy breakfast or a healthy snack. Win. Win. Win. This really is the easiest recipe. You basically make a warm blueberry sauce with blueberries, some lemon zest and a little sugar in a medium saucepan. Then you mix a little honey with some yogurt. Spoon the blueberry sauce over the yogurt in some cute bowls and you’re good to go. This was everything I love in a dessert. Lots of antioxidants from the blueberries and good for you probiotics from the yogurt. You could easily modify this to include whatever fruit you have on hand – blackberries, strawberries, peaches, and cherries would all be good. How about you, do you have any go to healthy desserts? Here are some more of my favorites: Apple Pie Smoothie and Strawberry Banana Yogurt Pops. Honeyed yogurt is topped with a warm blueberry sauce in this Blueberry Compote with Honeyed Yogurt. Bring blueberries, zest and sugar to a boil over medium heat. Cook, stirring until the berries have softened and release their juices, about 10 minutes. In a small bowl mix yogurt with honey and a pinch of salt. To serve divide honeyed yogurt between 4 bowls and top with the blueberry sauce. My mouth is watering! I’m def doing this! Thanks for sharing… here from Thursday Fave Things! Yes, you need to let me know what you think! I have to admit I have a huge sweet tooth and I totally don’t mind consuming empty calories if I have some leftover at the end of the day. But it is nice to have healthy options like this to trick myself into eating better. The blueberry compote looks delicious! This compote sounds so delicious! I’d love it on waffles. You had me at ‘make a warm sauce with the blueberries’ – This looks amazing, Pam. What a lovely, healthy treat. Scheduled to pin and tweet. Thank you so much for sharing, and for being a part of Hearth and Soul. Hope you will visit again this week! We love snacking on yoghurt and fruit, it’s such a great combo of flavours and this recipe looks lovely! Love this! I need something sweet at the end of the day too and this healthy treat is perfect! We have yogurt all the time for breakfast and I love to do my own mix-ins instead of those pre-mixed ones from the store. This sounds absolutely delicious — and that blueberry compote — Wow! We will love your Blueberry Compote with Honeyed Yogurt. Thanks so much for sharing with us at Full Plate Thursday. I have to try to make blueberry compote. I love fresh blueberries in muffins but I’m not a fan of raw blueberries. Although this recipe sounds like it would be great with peaches or strawberries which are favorites of mine. Blueberries and yogurt! Two of my faves. Looks delicious and something I would totally try. This sounds like such a treat. I don’t think I’ve made anything like this before but I’d love to! The warm blueberry sauce must be so good. Oh my two of my favorite yhings. Grabbing a spoon and be over to enjoy a bowl full. I am so hungry right now looking at my screen. Can you come make this for me for breakfast?! Yes, I’m like you, I need a dessert to feel the meal is complete! This is my kind of recipe: easy, sweet and delicious! Can I use double cream yoghurt instead of Greek yoghurt? Here in South Africa is a hassle to find it! I have to try this. Since you used yogurt I know I would love it, it looks delicious.